After the Thomas Bernhard program, the UAJO is working on a new project which deals with literary themes. 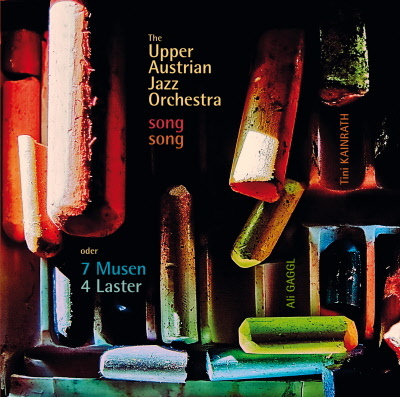 The authors are Austrian and the musicians have written, arranged, reworked and developed the concept in their usual way. Evelyn Schlag, Gerhard Ruiss, Semier Insayif , Wolfgang Kuehn, C.W.Bauer and also Tini Kainrath took on the task of writing the “Song” texts, and Christian Bachner, Robert Bachner, Robert Friedl, Helmar Hill, Christian Maurer, Andy Pranzl, Gerd Rahstorfer, Andy See, Primus Sitter, Alfred Vollbauer, Christian Wendt, gave the songs their musical clothes. Dr.Klaus Zeyringer, Literatur expert and consultant, already during Bernhard program, stood by us with his expertise for this new proect. "uajo-song-song" – doubling and/or repetition indicates a great deal. It is compression of the flow of speech or a pause. It accentuates on the one hand and glides into an echo, comparing itself with itself seeming childish. Or foreign? Eastern? Is it waiting, observing its image in the mirror? Is it quoting itself, talking to itself? An inner dialog of a word directed outward? Or something like that.